Review: The Museum of You | Live to read. Read to live. I think Carys Bray might be one of my most favourite recent authors. I read her debut novel A Song for Issy Bradley in 2014 (I talk about that here) and feel into a book love so hard it took me a while to recover so I was super excited when I learned that she has a new novel out in June. I also got to chat to her last year at one of Jen’s events. She signed a copy of Issy Bradley for me and was just as delightful as I had hoped – it’s always a pleasure isn’t it, when somebody you want to be lovely actually really is. 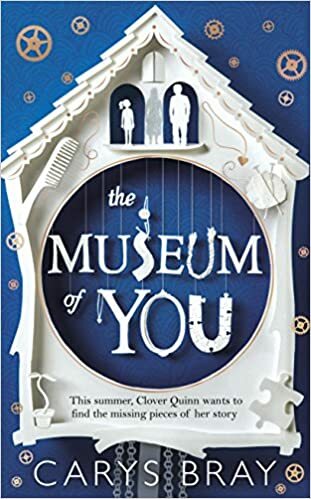 Anyway, point is, I read The Museum of You last week – I finished it last night - and I absolutely adore it. I think it’s the best book I’ve read this year. I kind of want to smoosh it close at the same time as I shove it in the faces of everybody I know with a demand of read this book right immediately right now. Have a blurb, people like blurbs. I like writing the word blurb. People aren’t speed bumps, you don’t get over them. Carys has a really strong, really unique voice and it’s one that fits really well with the way that I read, truthful and somehow at the same time simple but intricate and she has this way of getting right into the very heart of her characters. Clover and Darren aren’t just words on a page, they’re like real living breathing people that you feel like you know; that you want to know better. They step right off the page. There’s an exchange in a bedroom over a mug of warm water, between Darren and his Dad that choked me up. The whole damn book choked me up to be honest, but that bit: oh hello tears, where did you come from? It’s just….real. So very real. Oh, and Dagmar, the little girl in Clover’s class at school. Let me talk to you about Clover and Dagmar because those two girls, I swear, it’s one of the most beautiful perfect depictions of friendship I have ever read. Dagmar. Every single word about her made me feel all of the things and the scene near the end where she quietly confronts Clover about their friendship and what it means, it’s just so perfect and unflinchingly raw. I would like more Dagmar. I want to know the summer from her side. I want to know that she’s going to be ok. This is a beautiful read. This is writing as writing should be, it’s so easy to read, picking you up and carrying you gently along, you’re swept away and you don’t even realise it, just like you don’t even realise really how deeply it’s gotten under your skin and how wonderfully complex it is until hours have passed and your chest is tight and you look around to reach for Clover and hold her only to realise she’s not actually real after all. WHY IS SHE NOT REAL? It’s like, Carys Bray writes grief and quiet unassuming love like nobody else I can think of, in a way that hurts your heart but at the same time makes you feel hopeful and somehow better. It’s the same with love, he thinks. It doesn’t go anywhere. You can decrease its volume and increase its density; you can bundle it up, tight, but you still have to lug it around with you. The Museum of You was like a catharsis I didn’t even know I needed. Which, I know I know, but surely if you’ve stopped by here before you’re used to me making no sense by now. This book is sad y’all, it’s really really sad and that’s just a thing that is, and you get deep into it. Deep into Clover and this longing for a Mum she never knew (and God, Clover is so amazing, naïve and at the same time wise beyond her years and curious and so open) and deep into Darren and this struggle to be without Becky, to be everything to his little girl but it’s never sadness for the sake of it and it’s never over the top and it’s never prying. It is at its heart a simple story about love and loss and life, a simple story told in the most beautiful of ways. Bittersweet. Is that the word? Bittersweet and careful and compassionate and at times so honest it makes your breath catch. This is not a dreary sad times book that’s just going to leave you feeling sad and empty, it’s hopeful and it’s funny and Mrs Mackerel is the most excellent neighbour in the history of ever. Fact. And the ending is gorgeous. Really really gorgeous. I want you to read this book, please. Please. It's released in June - do yourself a favour and pre-order!